If OpsCenter role-based security is enabled, be sure that the permission for the Rebalance Cluster option in Cluster Topology is enabled for the appropriate user roles. Select the cluster to rebalance in the OpsCenter Monitoring navigation menu. Click Cluster Actions > Rebalance Cluster. The Rebalance Cluster menu option is disabled for clusters using vnodes or for those users who do not have the appropriate permission. OpsCenter checks if the token ranges are evenly distributed across the nodes in the cluster. If the cluster is already balanced, a message indicates rebalancing is not necessary at this time. 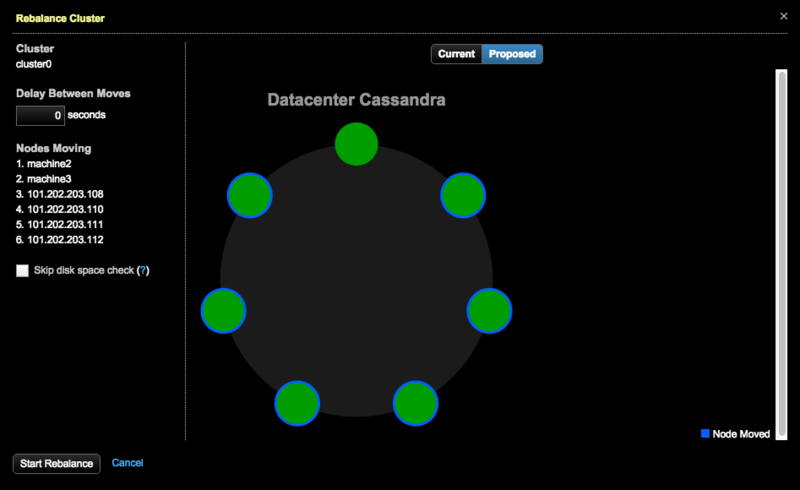 If the cluster requires a rebalance, the Rebalance Cluster dialog appears showing the Proposed and Current topologies. Click Current and Proposed to view each topology for before and after the rebalance operation. Optional: Indicate a Delay Between Moves in seconds between node moves. Important: Skipping a disk space check to verify enough disk pace is available is not recommended. Skip the check only if it causes problems or cannot be performed. Click Start Rebalance. Check the status of the rebalance in the Activities area. If a rebalance operation is cancelled before all nodes are moved, click Rebalance Cluster again to resume.